San Francisco: Sports cars are built for driving pleasure. But did you ever notice that most of them offer either a microscopic back seat or no back seat at all? Rejoice! The new RX-8 is here! For years, Mazda sold the two-seat RX-7. It featured Mazdas famous rotary engine, which instead of sending pistons up and down to generate energy, used twin-spinning rotors. In addition to producing a different sound (the famous Mazda hum), the RX-7 got a lot of power out of a small displacement engine. Sadly, the RX-7 disappeared in the mid 1990s. Not only does it come with a much improved rotary engine but it has "hold your breath", a back seat. Even better, it has four doors, so its easy for adults to actually enter and exit the rear compartment. Mazda cleverly hides the rear doors, so if you arent paying attention, you might think the car is a two-door model. The rear doors open at the front with the hinges in back, and they swing out 80 degrees, almost straight out, from the car. Without a center pillar, there is a huge opening, and the doors themselves are extra strong, making the RX-8 solid and safe. Besides its four-person carrying capability, the RX-8 can haul a weekends luggage or a couple of golf bags in its 7.6 cubic foot trunk. Try that with a Corvette! Mazda went all out in the design of this unique new sports car. The front fenders are sliced out of the body with almost entirely flat tops. Vents cut in aggressively behind the front wheels. The hood flaunts a prominent spear shape. The headlamps squint and the grille is pursed tight, giving the face an intense stare. The cars taut sides culminate in a thick ridge that connects the flared wheel wells. In back, the rear glass curves over, forming a mini fastback, while the clear tail lamps curve upwards towards it. Everywhere, the design creates dramatic tension. Inside, simply sculpted forms convey purposeful strength. An unusual circle motif on the center console reminded me of a CD, but it serves no actual purpose. A silvery, full-length console runs from front to back. The triangular rotor does extra duty as a styling motif in places like the top of the slender shift knob and in the seatback below the headrests. This latter use looked sensational, but my five-foot-tall son found that his head bumped it uncomfortably. Once you are nicely tucked inside, the fun begins. The RX-8 is fast. Motor Trend magazine clocked it at 6.4 seconds from zero to sixty, with a 14.8-second quarter mile at 94.3 mph. Amazingly, the RENESIS engine has only 1.3 liters of displacement, but puts out a big 238 horsepower and 164 lb.-ft. of torque with the manual six-speed transmission. The automatic-equipped car gets just 197 horsepower, but the torque numbers drop only slightly, to 159 lb.-ft. This car gets better mileage than previous RX models, at 18 city, 24 highway with the manual. It also runs cleaner, with the new engine meeting the strict Tier 2 emissions certification. The RX-8 handles like the true sports car it is. The front gets a double-wishbone suspension, and all four wheels use mono-tube gas-filled shock absorbers. The front to rear weight balance is a perfect 50-50. 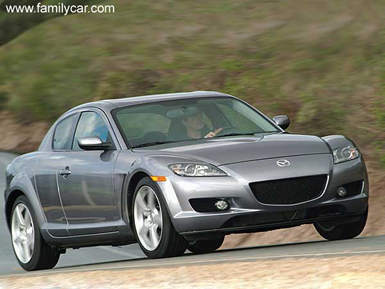 The RX-8 has Mazdas new electric-assist rack and pinion power steering, which doesnt steal power from the engine. Steering assist is speed related, so it supplies more help in parking situations, but once you are on the highway the assist drops away for firmer control. When you select your RX-8, you must decide whether to shift for yourself or let the car do it for you. My Velocity Red test car had a six-speed manual transmission, which is the way to go for fun and control. The RX-8s little sibling, the Miata, has always boasted fine shifting action, and this new car shows it belongs to the same family. After picking a transmission, your next choice is whether to order the Standard package or move up to the Grand Touring, Touring, or Sport trim packages. The Standard car has power windows, locks and mirrors as well as cruise control and a nice six-speaker audio system. The Sport package adds xenon headlights, fog lights, and Dynamic Stability Control (DSC). DSC uses the cars computer to stay safely on the road in emergency situations. The Touring Package adds a moonroof and upgraded Bose audio system to the Sport Package. The Grand Touring Package includes leather seating with lumbar support (heated in front) and heated outside mirrors. My tester had the Sport Package ($1,100) and the optional navigation system ($2,000), which pops up out of the instrument panel as needed and slips away again when you remove the key from the ignition. The system uses a single DVD for all the U.S. and parts of Canada. You can tip the screen electrically to cut glare, as needed. Column Name: Rejoice! The new RX-8 is here!